Nico Roth, a 6-1 senior forward and captain for the Millsaps Majors men’s soccer team, expresses his thoughts on Millsaps, games and captainship. 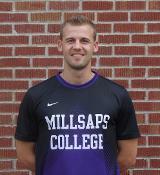 Roth hails from Alzenau, Germany, and began his career at Millsaps in 2013. Roth is making his last season as a Major count. In his 14 starts for the Majors this season, Roth has recorded 11 goals and 10 assists, as well as three game-winning goals. The Purple and White: Why did you decide to come to Millsaps? Nico Roth: There were a variety of reasons. Sometime between June and July 2012, I started with the idea of coming to the U.S. for soccer. Then I contacted a recruiting agency in Germany, which specializes in building contacts between German athletes and American coaches. The head soccer coach of the men’s soccer team here is a German native too and he is part of that network. He contacted me and actually flew to Germany to visit me and present the concept of Millsaps and the men’s soccer program and what it is like to be a student here at Millsaps… I think the difference in choosing Millsaps and not some other school was the effort they put in. P&W: Being from Germany, is it difficult to be so far away from your home? NR: It is sometimes challenging. I would be lying if I said it wasn’t. But at the same time, I am kind of used to it because I moved away from home when I was 15. At a very early age, I was confronted with the idea of moving away from home. When I got [to Millsaps], I was already 23, so it made it much easier to deal with the situation. P&W: What kind of responsibilities do you hold as the captain of the soccer team? NR: First of all, it’s a huge honor for me because being the captain is something special in a team sport… But it also includes responsibilities you have. For example, in tough games, you need to have the character to be calm on the field and be able to recognize what guys struggle right now in the situation—and be able to talk to them in a calm way to slow them down or make them aware of the situation and that it’s not that tough right now. That is one of the most challenging parts of being a captain. P&W: With the great career you have had at Millsaps, is there one game in particular that is the most memorable? NR: I don’t like boiling it down to one game. There are many good games we have had here at Millsaps. We have had an incredible two and a half years now, and we are still in pretty good shape to achieve high goals this year even though we are not able to win our conference season again. But to answer your question, for example, some weeks ago we had a game against Hendrix where I scored three goals and we won 3-2 [in two overtimes]. That is kind of memorable for me, of course. But at the same time, there are other games. When we played at Oglethorpe two years ago, we won 3-2 as well in overtime, and this game was kind of the tiebreaker to win the conference season that year. So it was a special moment as well even though I didn’t score in that game. P&W: With your season coming to an end, what are your expectations for the remainder of the season? NR: We have one more conference game left at Rhodes, and then we will start our conference tournament. Obviously the goal must be to win the conference tournament, because then we get an automatic bid to nationals. That will be the first time ever in Millsaps history [for men’s soccer], so that is a pretty big thing and that is what will be our goal this year.